A marlin or sailfish, family Istiophoridae, is a fish with an elongated body, a spear-like snout or bill, and a long rigid dorsal fin, which extends forward to form a crest. Its common name is thought to derive from its resemblance to a sailor’s marlinspike. The Atlantic blue marlin (Makaira nigricans) is a species of marlin endemic to the Atlantic Ocean. The Atlantic blue marlin (hereafter, marlin) feeds on a wide variety of organisms near the surface. It uses its bill to stun, injure, or kill while knifing through a school of prey, then returns to eat. Marlin is a popular game fish. The relatively high fat content of its meat makes it commercially valuable in certain markets. Marlin are rarely table fare, appearing mostly in fine restaurants. Most modern sport fishermen release marlin after unhooking. Luchy me i can bring this fish on my plate. 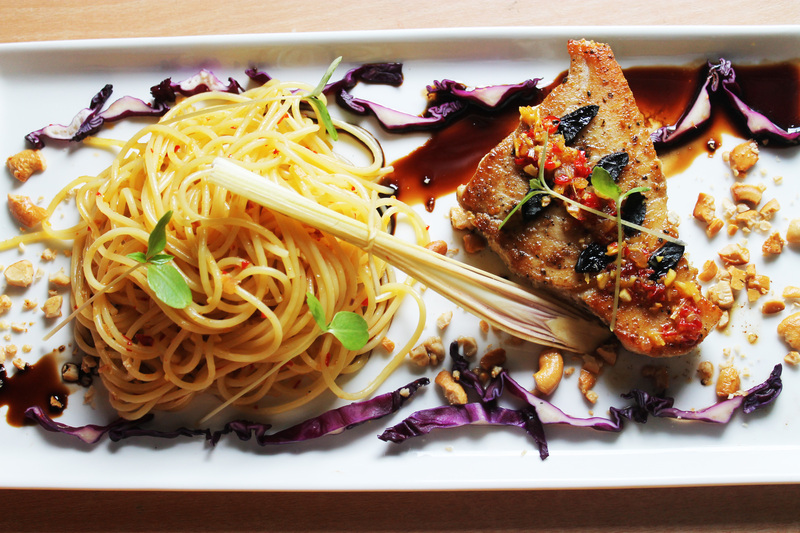 I like fine dining style home cooking, plating and combining the side is one of my passion lately. I buy marlin fillet yesterday and simply seared it to perection. I add some thai style chili & lemongrass sauce to accompenied. The creamy and fragrant sliced black garlic make the flavour rich even more. Ever since i’ve posted Super Food: Black Garlic (Fermented) & Pan Seared Scallop ala Dentist Chef, ilike to try out another menu that fit on exotic black garlic. 1 tbsp chopped lemongrass, soft white part only! Heat up the EVOO, saute black garlic, lemon grass and chilli until fragrant with low heat, don’t get browned! Add the white wine/rice wine and seasoning, bring to boil. Turn off the heat and add the chopped parsley for the last touch. Put all element on the plate, and serve immediately! This entry was posted in Extreme/Exotic Cuisine, Fine Dining (Homemade) Recipe, Indonesian Food, Italian Food, Japanese food, Resep Fusion Food, Resep Ikan (FISH), Resep PASTA, Resep SEAFOOD, Resep STEAK, Thailand food, Western Food and tagged aglio olio recipe, black garlic recipe, black garlic sauce, easy fish fillet recipe, how cook prepare marlin fillet, how make marlin steak, how make thai lemongrass sauce, how pan seared fish fillet, how to use black garlic, lemongrass spicy chili sauce, marlin fillet recipe, popular fish fillet recipe, resep saus sereh, resep saus sereh pedas, resep spagheti aglio olio, resep steak ikan, thai lemongrass fish recipe, tuna fish recipe, tuna steak recipe, yummy healty marlin recipe. Bookmark the permalink. … and this looks like a main course I will order in a five star restaurant!!!! 🙂 This looks and sounds wonderful, your are such a pro!! 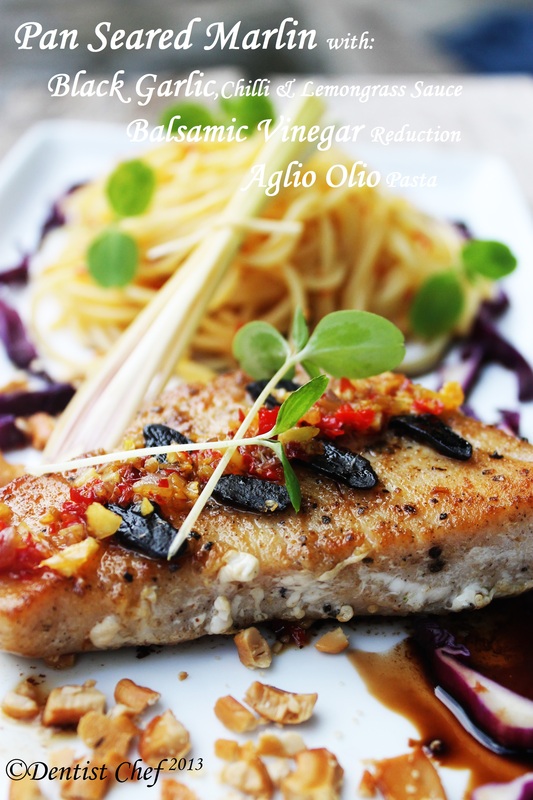 nice recipes, fish with balsamic reduction is sounds very delish ! Hi Dedy! What a pretty dish! And very flavorful, I imagine. I’ve never had marlin fish nor have I seen one. Fine dining at home..sounds wonderful to me! Less expensive and you can feel proud of yourself ;). I really want to try to cook more with lemongrass! And black garlic?! Is it more potent than the regular ones? Actually the real satisfaction is impress your partners and yourself…. black garlic is less fragrant then the raw ones, the texture more like roasted garlic and the taste s more creamy and milder compare to the raw garlic..
btw, thanks for comming by here…. Wow this looks amazing! 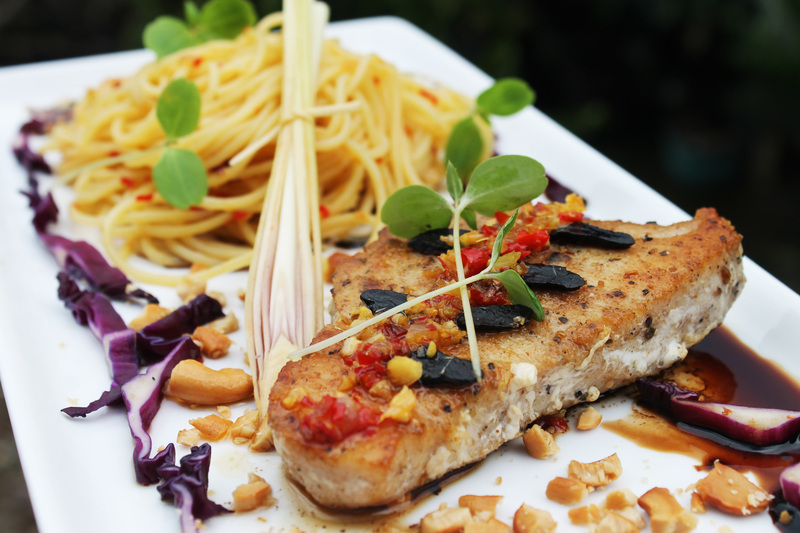 I love the flavors of lemongrass with fish, chili, and garlic. they just a best buddies for my taste buds….. I have a little package of black garlic I have been saving for a special recipe. I have found the perfect one! Thank you!